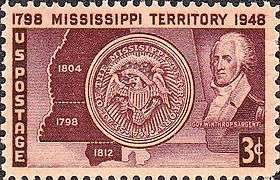 The Territory of Mississippi was an organized incorporated territory of the United States that existed from April 7, 1798, until December 10, 1817, when the final extent of the territory was admitted to the Union as the state of Mississippi. The United States and Spain disputed these lands east of the Mississippi River, until Spain ceded its claim with the Treaty of Madrid, initially signed in 1795 by the two countries' representatives. The Mississippi Territory was organized in 1798 from these lands, in an area extending from 31° N latitude to 32°28' North — or approximately the southern half of the present states of Alabama and Mississippi. The state of Georgia maintained a claim over almost the entire area of the present states of Alabama and Mississippi (from 31° N to 35° N), until it surrendered its claim in 1802 following the Yazoo land scandal. In 1804, Congress extended the boundaries of the Mississippi Territory to include all of the Georgia cession. In 1812, declaring that it had been included in the Louisiana Purchase (1803), the United States annexed the Mobile District of West Florida, between the Perdido River and the Pearl River. Spain disputed this and maintained its claim over the area. The following year, a Federal statute was secretly enacted authorizing the President to take full possession of this area with the use of military force as deemed necessary. Accordingly, General James Wilkinson occupied this district with a military contingent; the Spanish colonial commandant offered no resistance. 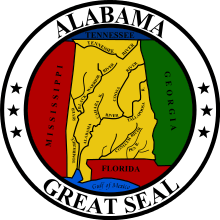 This annexation extended the Mississippi Territory south to the Gulf of Mexico, with the northern border being the boundary of the state of Tennessee, taking in all of what is now Alabama and Mississippi. Federal statutes enacted on March 1 and 3, 1817, provided a plan for the division of the Mississippi Territory into the state of Mississippi in the west and the Alabama Territory in the east (with St. Stephens, on the Tombigbee River, as the temporary seat of the Alabama territorial government). 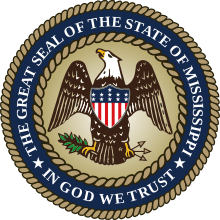 On December 10, 1817, the division was finalized when the western portion was admitted to the Union as Mississippi, the 20th state. The final boundary between Georgia and Mississippi Territory was defined to follow the Chattahoochee River north from the border with Spanish Florida. However the Chattahoochee's upper course veers northeast, deep into Georgia. So the boundary was defined to follow the river until it turned northeast, and then to follow a straight line north to the 35th parallel (whose role in state borders dates back to the split of North and South Carolina in 1730). The line was not run straight north but rather angled to meet the northern border of the territory one-third of the way west, leaving the other two-thirds for two future states (Alabama and Mississippi—though their angled boundary ended up stopping at the Tennessee River). Congress delineated the boundary between Mississippi and Alabama by dividing the territory into approximately equal sized parts, similar in size to Georgia. The agriculturally productive lands were divided by a straight line running south from the northwest corner of Washington County (as it was defined at the time) to the Gulf of Mexico. The border north of this point was angled eastward in order to keep Mississippi and Alabama roughly equal in size. At its northern end this angled border follows a short section of the Tennessee River. Congress chose this boundary because if the straight line had been run all the way to the Tennessee border Mississippi would have jurisdiction over a small piece of hilly land cut off from the rest of the state by the wide Tennessee River. The attraction of vast amounts of high quality, inexpensive cotton land attracted hordes of settlers, mostly from Georgia and the Carolinas and from tobacco areas of Virginia and North Carolina at a time when growing tobacco barely made a profit. From 1798 through 1820, the population soared from less than 9,000 to more than 222,000. Migration came in two fairly distinct waves – a steady movement until the outbreak of the War of 1812 and a flood from 1815 through 1819. The postwar flood was caused by various factors including high prices for cotton, the elimination of Indian titles to much land, new and improved roads, and the acquisition of new direct outlets to the Gulf of Mexico. The first migrants were traders and trappers, then herdsmen, and finally farmers. The Southwest frontier produced a relatively democratic society. After 1800, the development of a cotton economy in the South changed the economic relationship of native Indians with whites and slaves in Mississippi Territory. As Indians ceded their lands to whites, they became more isolated from whites and blacks. A great wave of public sales of former Indian land plus white migration (with slaves) into Mississippi Territory guaranteed the dominance of the developing cotton agriculture. President John Adams appointed Winthrop Sargent the first governor of the Mississippi Territory, effective from May 1798 to May 1801. William C. C. Claiborne (1775–1817), a lawyer and former Democratic-Republican Congressman from Tennessee (1797–1801), was governor and superintendent of Indian affairs in the Mississippi Territory from 1801 through 1803. Although he favored acquiring some land from the Choctaw and Chickasaw, Claiborne was generally sympathetic and conciliatory toward Indians. He worked long and patiently to iron out differences that arose, and to improve the material well-being of the Indians. He was also partly successful in promoting the establishment of law and order, as when his offering of a two thousand dollar reward helped destroy a gang of outlaws headed by Samuel Mason (1750–1803). His position on issues indicated a national rather than regional outlook, though he did not ignore his constituents. Claiborne expressed the philosophy of the Republican Party and helped that party defeat the Federalists. When a smallpox epidemic broke out in the Spring of 1802, Claiborne's actions resulted in the first recorded mass vaccination in the territory and saved Natchez from the disease. George Mathews, a former governor of Georgia, was then appointed the governorship, though the appointment was revoked before he took office. Third governor was Robert Williams, from May 1805 to March 1809. David Holmes was the last governor of the Mississippi Territory, 1809–17. Holmes was generally successful in dealing with a variety of matters, including expansion, land policy, Indians, the War of 1812, and the constitutional convention of 1817 (of which he was elected president). Often concerned with problems regarding West Florida, he had a major role in 1810 in negotiations which led to the peaceful occupation of part of that territory. McCain (1967) concludes that Holmes' success was not based on brilliance, but upon kindness, unselfishness, persuasiveness, courage, honesty, diplomacy, and intelligence. The eastern half of the Mississippi Territory was labeled the Tombigbee District and later Washington County. Ignored by the territorial government, the inhabitants were beset by hostile neighbors, militant Indians, and the usual frontier problems of land claims and establishment of law. 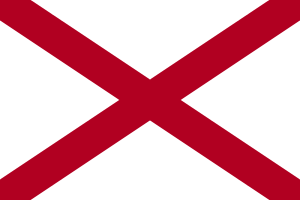 Solutions to these difficulties came slowly, and were not completely resolved when the territory gained statehood as the U.S. state of Alabama in 1819. English common law dominated the development of the judicial system in the Mississippi Territory. The citizenry considered the laws imposed by Winthrop Sargent, the territory's Yankee governor, as repressive and unconstitutional. 'Sargent's Code,' however unpopular, established the first court system for the territory and served as the precedent for later revisions. An 1802 judiciary act considerably simplified the court system. Several judicial reorganization acts followed in 1805, 1809, and 1814, though a modified form of Sargent's county court system and the considerable power held by judges continued. While the credentials of the members of the first territorial court were questionable, the quality of judges in later courts steadily grew. While the Catholic Church was active along the coast, Protestant religious activities began inland in the Mississippi Territory after 1799. Free thought, skepticism, deism or indifference to religion were characteristic of the wealthy planters and land speculators, as newcomers were far more interested in seeking riches in this world than in the next. Methodists, Baptists, and Presbyterians formed the three leading denominations in the territory. Protestant ministers won converts, often promoted education, and had some influence in improving the treatment of slaves. The people of the Mississippi Territory favored war with Britain in 1812. By 1810, belief in the national policy of economic coercion was waning in what was then called the Southwest, while desire for unrestricted trade and a vindication of national honor was rising, intermingled with desire for Spanish Florida. However, problems of land claims, Indians, internal improvements, and statehood issues continued to excite more local interest than the coming of war. Most saw no conflict between war issues and local interests; in fact, some foresaw war as a way of resolving certain local problems. Following a successful attack on a white expedition at the Battle of Burnt Corn, the Red Sticks, a hostile faction of the Creeks, determined to attack and destroy Fort Mims in the eastern part Mississippi Territory (modern Alabama). Poor scouting, an attack at noon when most of the garrison was eating, seizure of the port holes by the Indians, and inability to close the main gates were all elements in the defeat on August 30, 1813. Of the 275 to 300 whites and half-breeds in Fort Mims at the time of the attack, between 20 and 40 escaped; therefore, about 235 to 260 whites and friendly Indians were killed in the battle. Creek losses were at least 100 killed. The massacre had significant short- and long-range effects. It triggered a major Indian war that involved a substantial build-up of American military force in the area – which probably prevented the British from occupying an undefended Gulf coast in 1814. More importantly, relations between Americans and the southern Indians changed drastically. The Creeks, who had been living peacefully and in close contact with the settlers of the Mississippi Territory, lost more than half their land, and within twenty years were forced to move west of the Mississippi River. Brigadier General Ferdinand L. Claiborne, commander of the Mississippi militia, was not to blame for the massacre, but Major Daniel Beasley was guilty of gross negligence. At the Battle of Horseshoe Bend on March 27, 1814, American forces and Indian allies under General Andrew Jackson defeated the Red Sticks, killing most of the warriors and sending the rest fleeing to Florida, where they joined the Seminole tribe. 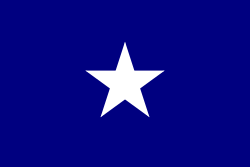 ↑ "An Act for an amicable settlement of limits with the state of Georgia, and authorizing the establishment of a government in the Mississippi territory"
↑ "An Act supplementary to the act intituled 'An act regulating the grants of land, and providing for the disposal of the lands of the United States, south of the state of Tennessee'"
↑ "An Act to enlarge the boundaries of the Mississippi territory"
↑ "An Act authorizing the President of the United States to take possession of a tract of country lying south of the Mississippi territory and west of the river Perdido"
↑ "An Act to enable the people of the western part of the Mississippi territory to form a constitution and state government, and for the admission of such state into the union, on an equal footing with the original state"
↑ "An Act to establish a separate territorial government for the eastern part of the Mississippi territory"
↑ "Resolution for the admission of the State of Mississippi into the Union"
1 2 Stein, Mark (2008). How the States Got Their Shapes (paperback edition). HarperCollins. pp. 11–17. ISBN 978-0-06-143138-8.